Some notes on the history of Vegetarianism in Dublin Pt. I (1866 – 1922) | Come Here To Me! Note: Part two of this article can be read here. Vegetarian Restaurants in Dublin date back to the late 19th century while groups of Vegetarians have been organising events in the city since at least the 1860s. In September 1866, a public meeting on Vegetarianism in the Exhibition Rooms, Rotunda Hospital was heckled by several members of the public. The meeting was held ‘for the purpose of affording an opportunity to several prominent vegetarians (to) explain … the principles and practices of the Vegetarian Society’. There was a large attendance of respectably dressed persons, but there were many amongst the audience who evidently attended the meeting more for the purpose of disturbing the proceedings and amusing themselves in a very disorderly manner. Amongst those speaking were Carlow-born social reformer and temperance activist James Haughton (who had become Vegetarian in 1846); Rev. James Clarke of Salford (who had helped establish the American Vegetarian Society in 1850); ‘acknowledged statistician of the British temperance movement’ William Hoyle from Bury and writer and campaigner James A Mowatt from Dublin. The last question put was directed to the Rev. Mr. Clarke, who was asked, amid much laughter what he should do at the North Pole, where there were no vegetables. The reverend gentleman said he should not go there at all. The proceedings then terminated. The first Vegetarian restaurant in Dublin, the ‘Sunshine Vegetarian Dining Rooms‘, was located at 48 Grafton Street (now Vodafone) and was opened in March 1891 by the Dublin Vegetarian Society. Consisting of a ‘pair of the most elegantly-decorated and tastefully-fitted apartments’, the restaurant served ‘toothsome food, free from the slightest suspicion of animal matter … at a surprisingly moderate rate’. The same article from The Irish Times noted that the ‘question of vegetarianism has not to any great extent excited public discussion in Dublin’ but the journalist wondered if this might change as the ‘restaurant has been extremely patrionised’ since opening. It is unclear how long the restaurant was in business. I would guess for for a few months or maybe a year at most. 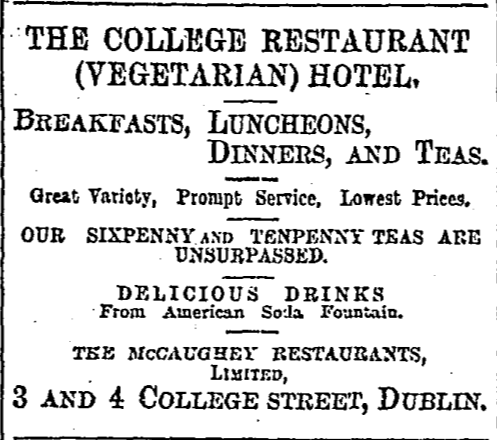 In July 1899, the ‘The College Vegetarian Restaurant‘ was established at 3-4 College Street by Antrim man Leonard McCaughey. This hotel and restaurant is the present location of The Westin (as far as I can work out). …had built a chain of successful vegetarian restaurants in Glasgow, Leeds, Belfast and in Dublin … (and that he) owned the Ivanhoe Hotel in Harcourt Street, Dublin, and the Princess Restaurant on Grafton Street. The 1911 census lists Leonard Mccaughey as a 70-year-old hotel proprietor from Antrim living in 72.1 Harcourt Street with a wife, three children, a cook and two servants. An advertisement in The Irish Times on 2 February 1900 proclaimed that ‘Vegetarian food is the coming diet’ and suggested that ‘every man and woman that has suffered from influenza should dine at the College Restaurant as the use of a pure diet is the simplest and surest cure for this woeful disease’ and another on 27 April of the same year noted that ‘The College Vegetarian Restaurant is the seat of learning in the science of food. In it all can learn how to get the best food in the easiest digestible form, at the lowest cost’. In 1907, the Vegetarian Society hosted a once-off restaurant at the Irish International Exhibition at Herbert Park. The Irish Times (11 May 1912) reported that a foreign chef at the restaurant on College Street, Leon Cromblin, was discovered in the cellar of the premises with his throat badly cut and a razor by his side. He was taken to Jervis Street hospital where he was said to have been in a critical condition. It is not known if he survived. The restaurant at College Street is mentioned a number of times in the Bureau of Military Witness Statements. Dr. Seamus O’Ceallaugh (BMH WS471) notes that just before the Easter Rising he was invited to a meeting in the Vegetarian Restaurant by Fenian Rory O’Connor where there was discussion about the upcoming rebellion and attempts made to decode the forged ‘Castle Document’. At least four such meetings took place. In addition to O’Ceallaigh and O’Connor, those present included republican solicitor PJ Little, Francis Sheehy-Skeffington, writer Andrew E. Malone (LP Byrne), IRB poet Charles Kickham and playwright Dr. Seamus O’Kelly. Dublin Brigade IRA member Michael Lynch (BMH WS511) speaks about a waiter in the restaurant who had overheard a group of Trinity College students talking about plans to set fire to the headquarters of Sinn Fein at no. 6 Harcourt Street on Armistice Night 1918. This waiter informed Sean MacMahon, Vice Commandment of the 3rd Brigade IRA, who managed to mobilise republicans at the last minute to defend it and other buildings. In the end, a motley group of ‘British soldiers, British ex. soldiers … young men of the tramp class and a proportion of students of Trinity College’ did launch some minor attacks on the Sinn Fein HQ, the Mansion House, St. Teresa’s Hall on Clarendon Street and Liberty Hall but thanks to the waiter in the Vegetarian Restaurant, local republicans were able to call up men to help fight off these attackers. Similarly poet and editor of The Dublin Magazine Seamus O’Sullivan wrote (IT, 16 Oct 1943) about being brought to this ‘famous and well-conducted vegetarian restaurant’ by his father in 1901 where they used to see ‘the bearded and spectacled features of A.E. 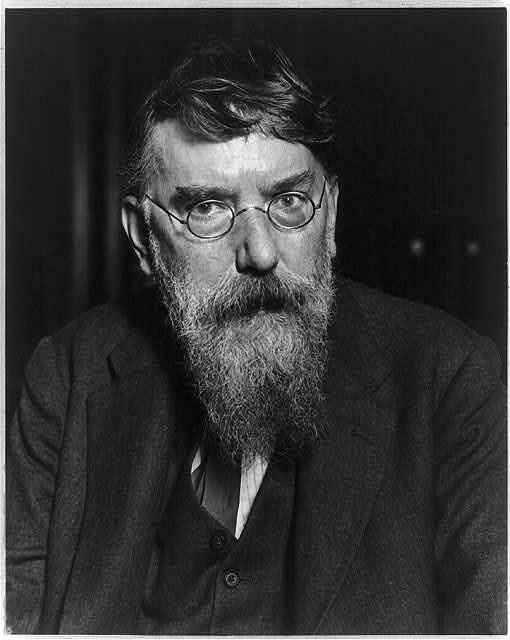 and with him, Harry Norman, Paul Gregan … and others of that small, but distinguished, group of workers and writers connected with the Irish Agricultural Organisation’. The restaurant remained open for a very respectable 23 years. In January 1922, the premises was sold with the furniture and fittings sold by auction. Our second part of this article will focus on Vegetarian restaurants from the 1920s up to the end of century. Part two of this article can be read here. While Bananas on Stephen Street was the earliest “normal!” Vegetarian Restaurant I remember, the Hare Krishnas had one off Dame Street very early, and there was one on Strand Street where there was a tragic fire even earlier. Great stuff, procrastinating on the thesis by researching the history of Chinese restaurants in Galway prompted by the earlier post on here. Excellent article. I thought veggie restaurants only hit Dublin in the 1960s! Great article. I didn’t know there was such a long history of vegetarian restaurants in Dublin. – Leopold Bloom in Ulysses by James Joyce. Anyone remember The Supernatural Tearooms on Harcourt Street circa 1975, brown rice bloats a belly. The little-known Dublin published, short-lived Pioneer. A Mid-monthly Magazine for Thinkers and Reformers, edited by James H. Cousins containing contributions by the Sheehy-Skeffingtons, Maud Joynt, Suzanne Day, Pierce Leslie Pielou and fellow theosophists, Celticists, and amateur archaeologists of the day, promoted the benefits of a vegan diet throughout its four scarce issues. I would like to add my Grandfather Avary Gordon Palmer to that list. Can I find out more about the Pioneer? Love to know more about the restaurant as my Grand Aunt ran a vegetarian cafe in the 1900’s in Westland Row. Thanks. The last comment from Your Vegetarian Kitchen is SPAM – produced by ‘Bots’. Have you heard of Ideal Cafe in Westland Row?